Researchers say a highly aggressive strain is migrating south from the Canadian Maritimes. Shellfish beware. BIDDEFORD — There’s bad news on the horizon for coastal Maine regions already beset by green crabs: the destructive buggers could soon become, literally, even nastier. In the world of green crabs – the small but voracious invasive species threatening Maine’s soft-shell clam industry – ancestry apparently plays a big role in attitude. For nearly two centuries, Maine has been home to a more docile variant of green crabs originally descended from southern European transplants. The cooler waters of Nova Scotia, meanwhile, are populated by more aggressive (and hardier) green crabs whose ancestors hitched a ride to the Canadian Maritimes from northern Europe a few decades ago. Now, coastal currents are carrying larvae from those more aggressive – as in, “offense is the best defense” aggressive – green crabs from Nova Scotia to Maine. 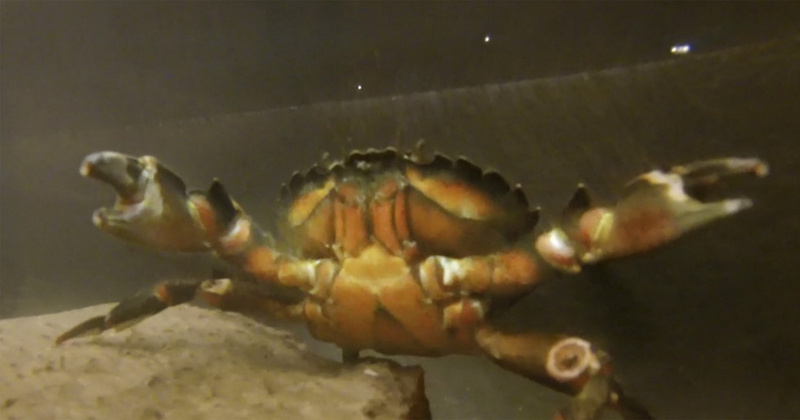 In this still frame from a video clip, a species of green crab adopts an aggressive posture after a camera was placed in its tank at a research lab at the University of New England in Biddeford. University of New England professor Markus Frederich and his research team are trying to discern what, if anything, the latest invasion could mean to Maine ecosystems already struggling to cope with a population explosion of the more docile green crabs endemic in the state. Measuring anywhere from less than an inch to 3 or 4 inches across, the European green crab isn’t always green, despite its name, but often has a mottled greenish or brownish color. The adaptable crabs can be found in mudflats, tidal marshes and even on rockier shorelines. Frederich said it is virtually impossible to tell apart the southern and northern European varieties at a glance. Green crabs have already decimated soft-shell clam flats in areas of southern Maine, contributing to a nearly 40 percent drop in commercial clam landings in five years. In 2015, Maine’s soft-shell clam harvest was valued at $22.8 million but had fallen to $12.4 million by last year. Professor Markus Frederich holds two green crabs that are typical species that have been wreaking havoc in the Gulf of Maine over the past few years. Frederich has been conducting tests on a more aggressive species of green crabs that could be coming into Maine waters from the Canadian Maritimes. Although present in Maine since the 1800s, green crabs are now a major predator of bottom-dwelling bivalves, mollusks and other small critters that are important cogs in the ecosystem and food chain. Green crabs have also eradicated meadows of eelgrass that serve a critical ecological role by providing nurseries for many fish species as well as habitat for invertebrates and marine mammals. With no natural predators in the U.S. or ways to control – much less eradicate – them, green crabs are expected to become even more numerous and disruptive if a changing climate continues to warm the waters of the Gulf of Maine. Frederich said it is still unclear what an influx of more aggressive green crabs from the Canadian Maritimes could mean for Maine. Northern European crabs are more cold-tolerant than their southern counterparts, so Frederich worries that hybrids could be both cold-water and warm-water tolerant. There is also the question of whether the Nova Scotian variety would be more destructive to eelgrass, although Coffin said the green crab variety endemic in Maine has taken care of much of the grass already. But part of Frederich’s research, he said, is to get a better understanding of why both varieties of crabs have been so successful in order to come up with ways to mitigate those successes. His team put docile and aggressive green crabs through a series of tests to better understand the physiological and behavioral differences between the two varieties. 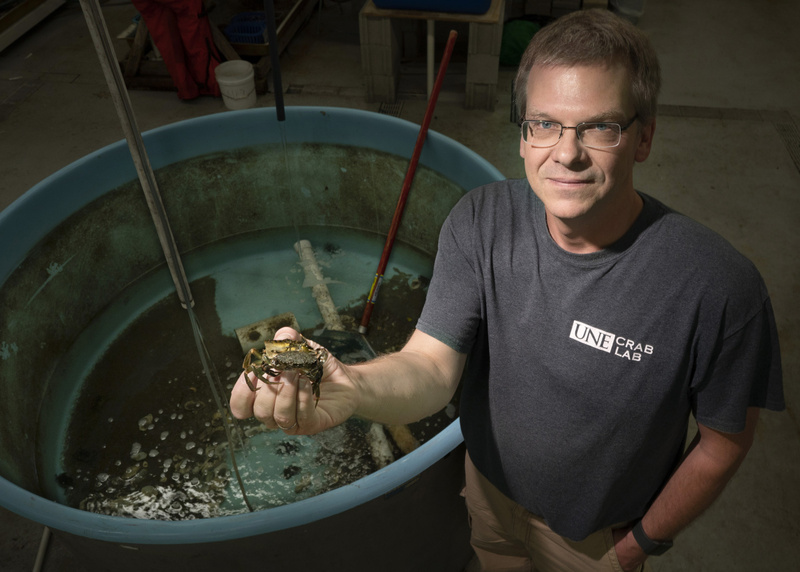 In their lab located in a marine sciences building tucked into a corner of UNE’s Biddeford campus, Frederich gauges crabs’ defensive instincts by attempting to poke crabs in their mouth parts. A video of several such interactions shows a Maine green crab desperately fleeing the approaching finger to the point that it actually crawls out of the research tub. A crab collected from Nova Scotia, meanwhile, immediately attacks the underwater camera even before a research team member could attempt to poke the feisty critter. “The others (from Maine) would try to run away and hide, but the ones from Nova Scotia literally jumped out of the water at us,” Frederich said. In another experiment, Frederich’s team placed green crabs on miniature underwater treadmills and tested whether changes in temperature, salinity or prolonged exposure to low-oxygen environments beforehand affected their endurance. The result? Green crabs from Maine and Nova Scotia are exceptionally hardy, with one crab running at 50 percent of his maximum speed for two hours. That equaled a 1½-mile jog for a crab that measures just a few inches across. “If they want to get somewhere, they will,” he said. Like Coffin, Frederich agrees there’s only one answer to Maine’s green crab problem: adaptation. Last month in Portland, researchers, fishermen and chefs from New England and Canada gathered to explore the culinary potential of green crabs. The small crustaceans are considered a delicacy in parts of Europe, such as Venice, Italy, where they are a native part of the environment. Yet Brian Beal, a University of Maine at Machias professor who has been studying green crabs and soft-shell clams for years, said Maine is never going to trap and eat its way out of the green crab invasion. That’s because green crabs won’t fetch the per-pound price needed to justify many fishermen investing in the gear needed to harvest them, thereby eliminating the likelihood of a large-scale, commercial fishery Maine. Beal studies the overall impacts of green crabs – particularly on the soft-shell clam population – rather than the behavior or genetics of crab populations. The prospect of more aggressive crabs “doesn’t bode well for soft-shell clams,” Beal said, although he said a warming Gulf of Maine could be the biggest driver in crab behavior. “All that I am seeing says that as seawater temperatures continue to warm, we are going to see higher rates of predation simply because these organisms’ metabolism and their behavior changes with temperature,” Beal said. Coffin, the clam harvester, said he’s seen his share of more aggressive green crabs although he had no knowledge of whether they were different varieties. “There are aggressive green crabs here, for sure, and there have been for as long as I’ve been paying attention to them,” Coffin said. Coffin agrees that warming water temperatures – and the resulting, longer active season for green crabs – pose an intensifying threat to the clamming industry because it will mean fewer clams will grow to commercial size. “The shellfish industry is in trouble down here,” Coffin said. Frederich hopes to publish a scientific paper on his research into more aggressive green crabs later this year. The research team will then continue examining whether these more aggressive crabs would be even more destructive to clams and eelgrass. “We don’t know that yet,” he said.